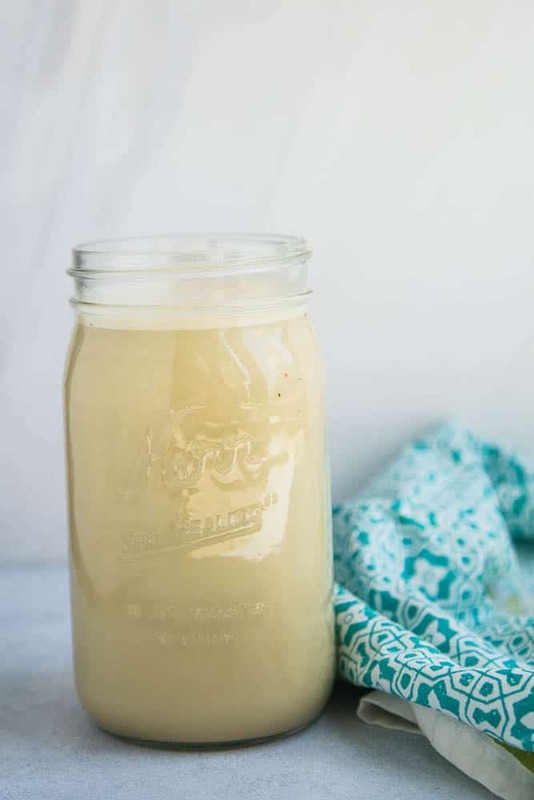 I’ve made homemade coconut milk, almond milk, and cashew milk before, but never pistachio milk. 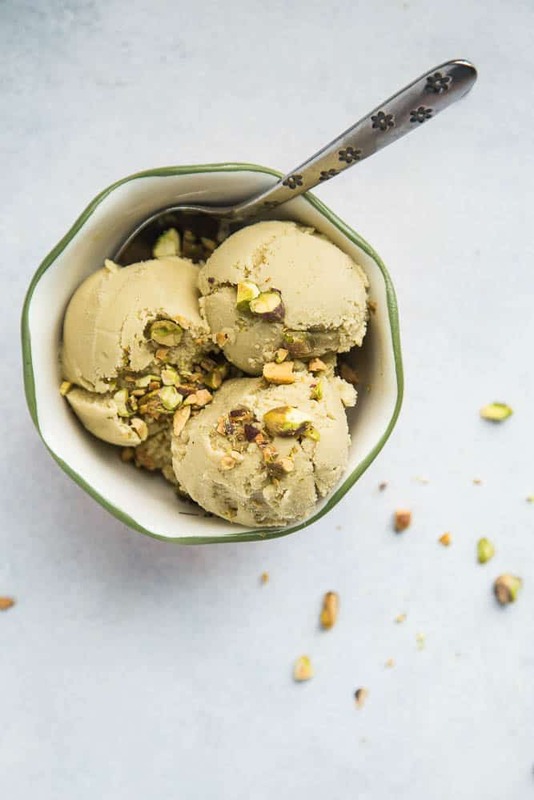 Spoiler: pistachio milk isn’t any different. Then BOOM. Pistachio milk. I love the light green-ish color and richness it has! I don’t think I’ve ever talked about my nut milk bag on here. 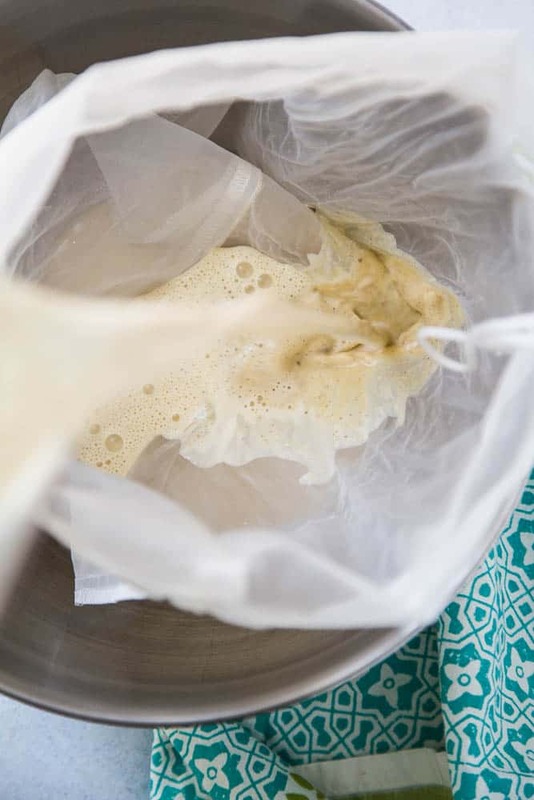 I got it from Ellie’s Best and it really is THE best nut milk bag I’ve ever used. It’s big and sturdy and even stands up on its own while I’m pouring. You can use it for nut milk or squeezing the water out of shredded zucchini/cauliflower or coffee. It makes it so much easier. And it cleans up well, too. This is kind of an involved recipe, but it’s nice that you can break the prep work into chunks. The pistachio milk will keep for about a week in the fridge. And the ice cream base will keep chilled for a few days, too. I don’t say this often, but one of my favorite things about this ice cream is that my kids didn’t like it. (Well, except for my “mustachio”-loving 3-year-old.) It’s something I can pull out for Steve and me and we can take our time with it and not open the freezer after the kids have gone to bed to find that they’ve already eaten it. We’ve been on a low-carb/keto kick lately, so I used erythritol-based Swerve granulated sweetener in this. I’ve been buying it on Amazon for a while, but I noticed it’s less expensive on Thrive Market — if you happen to use them. 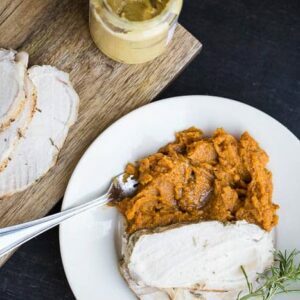 It’s like an online natural foods-focused membership store. Like Costco. Only you don’t have a “snack lady” trying to convince you to buy a cheesecake on a Wednesday afternoon for no particular reason. 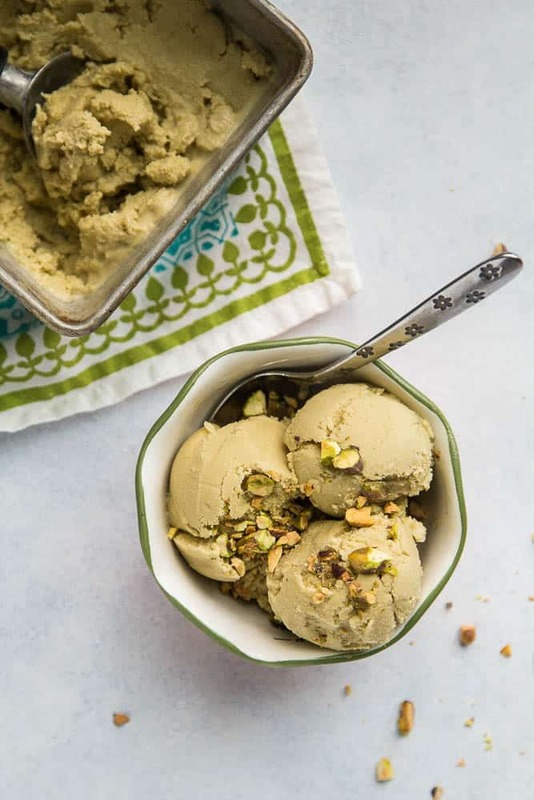 Meanwhile, make a batch of this Dairy-Free Pistachio Ice Cream and enjoy a few more nights out on the porch after the kids go to bed. 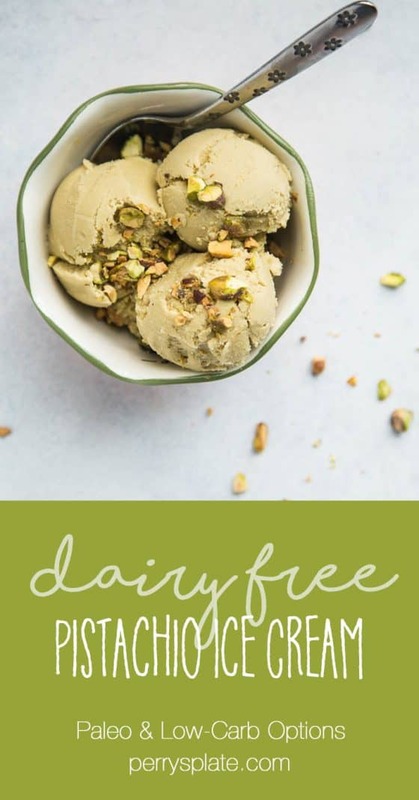 Dairy Free Pistachio Ice Cream starts off with homemade pistachio milk -- it's easier than you think! 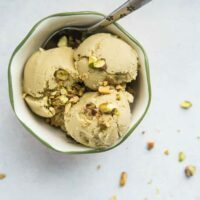 This ice cream is naturally sweetened and has a low-carb/keto option, too. 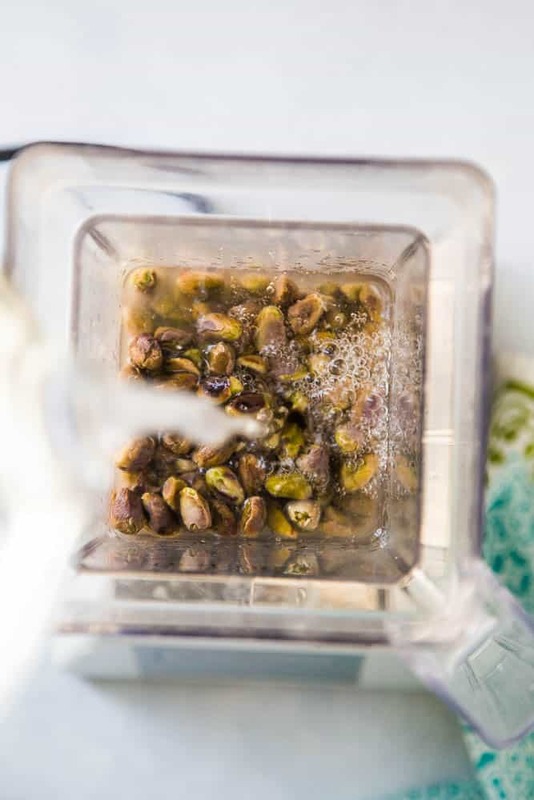 If your pistachios are salted, give them a good rinse. Put the nuts in a small heat-safe bowl and pour very hot water over them. Let them soak for at least 30 minutes or up to 2 hours. 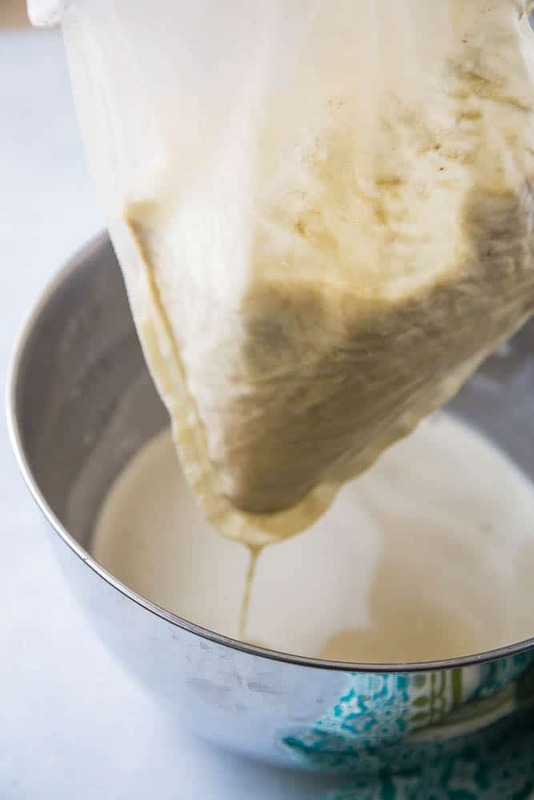 Place the pistachio milk in a medium saucepan and add the granulated sweetener. Cook over medium-low heat, stirring often, until it gets steamy and the sweetener has dissolved -- do not boil. Meanwhile, put the egg yolks in a small mixing bowl. When the milk mixture has heated, slowly whisk a ladle full of the hot liquid into the yolks. Then whisk the yolk mixture back into the milk mixture. Cook over medium low for another few minutes until the ice cream base has thickened slightly, lightly coating the back of a spoon. 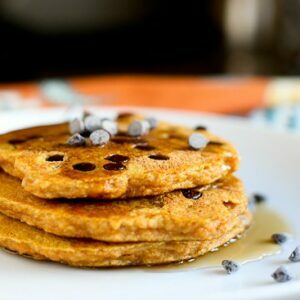 Turn off the heat and stir in the vanilla stevia, vanilla extract, and coconut cream. Stir for a minute or so until the coconut cream melts. Strain the mixture again through a fine-mesh strainer -- if you want. This ensures that you don't have bits of scrambled egg yolk in your ice cream. Chill the mixture for at least 2 hours. Freeze the ice cream mixture in your ice cream maker according to the manufacturer's instructions. Serve. With some extra chopped pistachios, if you like. Disclosure: This post contains affiliate links. Purchases made by using these links doesn’t cost you any extra and helps to keep my content free. Yummy! Absolutely delicious! 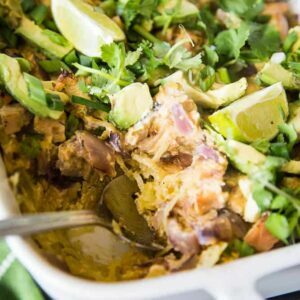 This is a different recipe and loved it.